To view highlights and pictures click here. FLORIDA – Following protests by airport workers on Tuesday, adjunct faculty from across Florida joined with striking fast food workers to call for greater investment in Florida’s colleges and to make it easier for working people to join together in unions. The rally, held at Miami Dade College and McDonalds, came just one month before midterm elections and just days before union members launch a 1,000 person Miami canvas for progressive candidates. Adjuncts at Miami Dade College filed for their union back in July, but the school has refused to allow them to vote for their union. Rally participants say that low-road employers like Miami Dade College, the state’s largest college, and McDonalds are trapping their employees in poverty. They argue that elected leaders must demonstrate how they will support efforts to reverse this trend by supporting workers’ right to unionize. “Unions are the backbone of our economy, ensuring that workers have safe working conditions and fair wages,” said State Rep. Shevrin Jones, democratic representative of Florida’s 101st District and Democratic Ranking Member for the Education Committee. Earlier this year, Rep. Jones introduced the Sunshine Scholarship Program that proposed free college for Floridians. Joined by students at Miami Dade College and community partners, adjuncts and fast food workers launched their coordinated effort to mobilize a voting bloc in support of their demands for fully-funded free college, student debt forgiveness and $15 an hour wage and union rights for all Floridians. Florida invests the least out of all 50 states in public services, and higher education has borne the brunt of disinvestment. Over the last decade, Florida elected officials have defunded higher education to the tune of 23 percent per student, while tuition has increased by 62 percent in that same timeframe. This has left more Floridians trapped in low-wage jobs with little opportunity to improve their lives. In Florida, more than 3 million people live in poverty and 1 in 5 workers find themselves working in low-wage jobs. Workers are paid less than $15/hour, and their power to join together and negotiate for higher wages, affordable healthcare, and other improvements is under attack. At the same time, years of austerity in Tallahassee have resulted in a broken higher education system that leaves too many in debt and poverty in Florida, adjunct professors say. Florida invests the least out of all 50 states in public services, and higher education has borne the brunt of disinvestment. Over the last decade, Florida elected officials have defunded higher education to the tune of 23 percent per student, while tuition has increased by 62 percent in that same timeframe. Today, Floridians hold nearly $80 billion in student loan debt and adjunct professors are paid so little that many have to rely on government assistance. This has left more Floridians trapped in low-wage jobs with little opportunity to improve their lives. 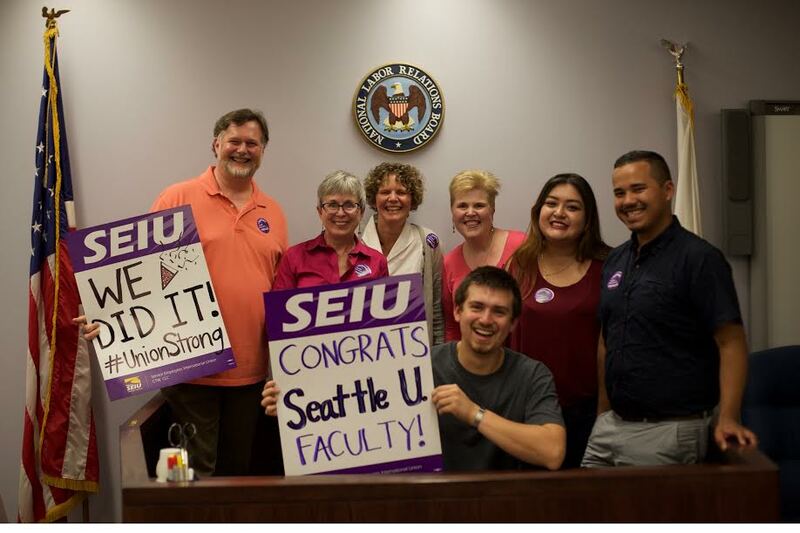 Adjuncts, who are part of the growing SEIU Faculty Forward movement, have called on political candidates at the gubernatorial debate and town hall meetings in Tampa, St. Petersburg and Miami to commit to reinvesting in students and educators alike by supporting free college and the right to form unions for all Floridians. Democratic gubernatorial candidate Andrew Gillum recently endorsed unionizing efforts by adjuncts and joined adjunct faculty from across the state this summer to deliver food to Miami Dade College’s food bank, which serves students and faculty in need.